I’m getting so excited for the holidays! I do a lot of holiday cooking, especially for Thanksgiving and Christmas, so I thought it would be fun to giveaway a prize that would help one of my readers with all of their holiday cooking. One of my readers will win a gift basket (um, gift bowl?) full of holiday cooking tools that just happen to be one of my favorite colors for kitchen stuff: RED! 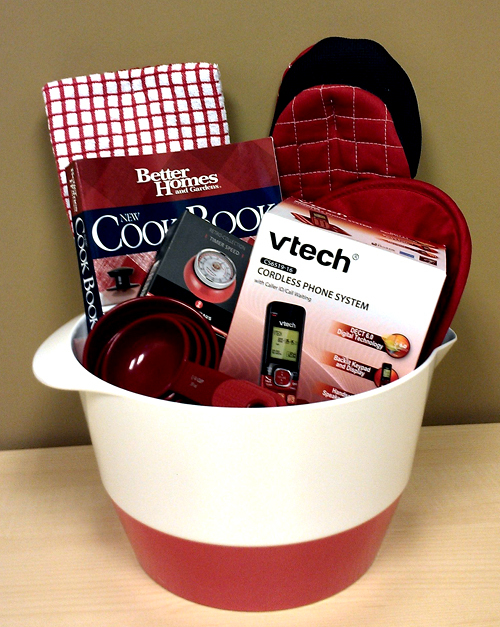 Not only will these items help you with your holiday cooking, but there is even a red VTech phone that matches everything. The holidays are one of the best times to connect with family and friends and this VTech phone will help you do it in style. To enter, use the Rafflecopter below. Mandatory entry is to leave a comment below and tell me what you favorite part of the holidays are. There are several other ways you can earn bonus entries. Originally published on 2012-09-21 by Brandie at Home Cooking Memories .